Karen House : Jan. 31, 2018, 2:39 p.m.
Jan. 31, 2018 – Ben Farmer, of Farmer/Morgan design firm, called a meeting with community leaders Wednesday, Jan. 31, to discuss a tentative summary of information gleaned from public meetings regarding tourism development in Sequatchie County. “We got out of it what we needed with regard to specific assets – the ones that rise to the top – that can be developed,” Farmer explained. An inventory of places and local events that might attract visitors included features that were cultural, natural, recreational, scenic, historic, etc. The river, mountains, and general scenic beauty were pinpointed as one of the top assets listed. Some of the local tourist attractions that impact Dunlap actually are located just outside Sequatchie County, including the Cowboy Church in Bledsoe County and Dead Zero Shooting Park in VanBuren County, but a lot of their business goes through Dunlap. Lodging is the main problem the panel discussed. Until recently, Mountain Inn & Suites was the only motel in the city. Big Al's (formerly Buffalo D's) recently opened with extended stay lodging, County Executive Keith Cartwright pointed out. The group then discussed instituting an occupancy tax that innkeepers would tack on to a guest's room bill, with proceeds to go toward a tourism budget. Winston Pickett pointed out that an agreement would have to be worked out between the city and the county, because currently the only lodging is in Dunlap. 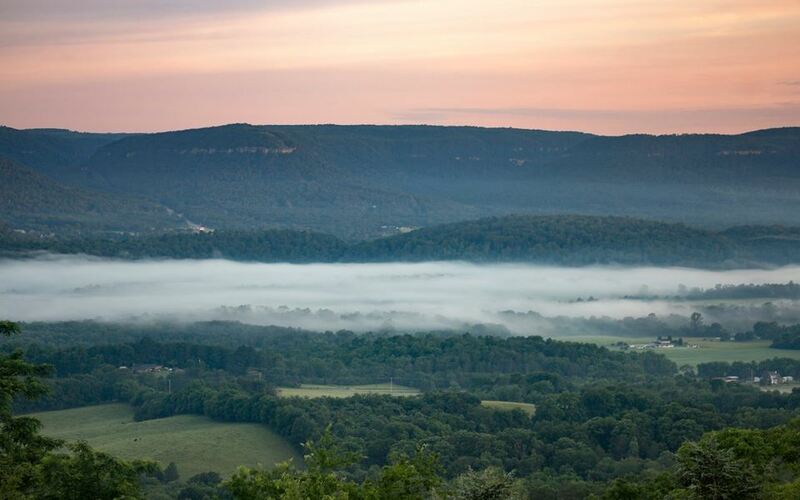 The natural beauty of the Sequatchie Valley is one of its greatest tourism assets. Photo by Chuck Sutherland. Used by permission. Possibilities that were discussed included a bed-and-breakfast, RV parks, and Airbnb. Other tourism assets considered for development include bicycle routes, geocache tours, and walking and hiking trails with a possible link to the Cumberland Trail. The tourism study is about 80 percent finished, Farmer said, noting that his design firm is on track for meeting their February target for completion. Then the information will be presented to local officials so they can make some decisions about how to develop tourism in the area.